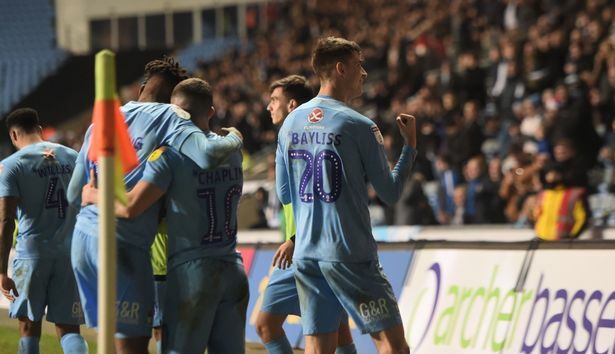 Teenager Tom Bayliss snatched a dramatic 89th minute win to hand Coventry City their first victory in ten long games as they overcame fourth placed Charlton Athletic at the Ricoh Arena. Jordy Hiwula gave the Sky Blues a deserved first half lead, heading home in the 41st minute after the home side had largely dominated the play in front of the 13,013 Boxing Day crowd. The Addicks were limited to just one chance on target in the opening 45 when danger man Lyle Taylor was denied by a decent save by Lee Burge. The visitors, however, pulled level on 57 minutes from a free-kick that Coventry disappointingly failed to defend properly. But Bayliss popped up at the death with a fine finish across the keeper to give City their first league win in eight games. City made a decent start to the game with three corners in the opening 16 minutes during which they dominated possession in the final third. The full-backs, Dujon Sterling and Brandon Mason, were getting forward well and sending in some decent crosses, two of which resulted in Conor Chaplin and Jordan Willis sending efforts narrowly wide. Hiwula, who was deployed in his natural striking position rather than out wide, made his presence felt with a lively display and won a free-kick when he was tripped while dribbling into the box, resulting in a decent chance when Chaplin hit the resulting set-piece from the edge of the box, forcing the keeper push over the bar as Robins’s men took the game to their opponents. And their dominance and endeavour paid off four minutes from the break when Chaplin sent in a cross from the left which Hiwula flicked over the keeper to give the home side a deserved lead going into half-time. Despite a determined start the second half, City’s current Achilles heel, defending set pieces, saw the Addicks get back in the game just before the hour when substitute and former City midfielder Mark Marshall sent in a free-kick which Coventry failed to deal with. Centre-back Patrick Bauer won the first header, flicking on to Darren Pratley who nodded home unchallenged from close range to see the visitors back on level terms. Robins responded shortly after by sending on Jonson Clarke-Harris for wide man Jordan Shipley as the game opened up with end to end counter attacks, City looked stretched at the back at times as Athletic lumped long balls upfield. But City’s persistence paid off a minute from time when Luke Thomas threaded a lovely ball into the box for Tom Bayliss who took it in his stride and hit a sublime shot across the keeper and inside the far post to score the winner. City had five minutes of added time to hang on to their slender lead, during which Thomas was stretchered off injured after colliding with George Lapslie, who also had to go off, leaving the visitors down to ten men for the dying minutes. But hang on they did to complete the double over Charlton and record a much-needed three points.